Citing military sources, CNN reports the United States just dropped a 30-foot-long bomb with a blast yield equivalent to 11 tons of TNT on suspected ISIS targets in Afghanistan. Nicknamed MOAB (short for “Mother of All Bombs”), the weapon is the largest non-nuclear bomb in America’s arsenal. This is the first time a MOAB has been used in combat. 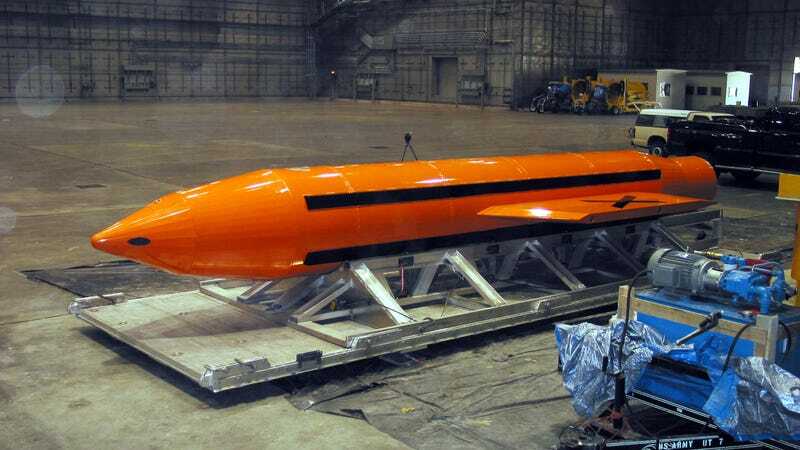 Now that the MOAB has made its debut in combat, who knows where the military will send it next. Maybe North Korea. Maybe Iran. Maybe Kansas. It’s entirely unclear what the world will look like in a week’s time. But hey, at least it wasn’t a nuke. Not yet, anyways. This story is developing, and we’ll update it as we learn new information. In the meantime, don’t even bother hiding in a bunker. At a reported cost of $16 million per bomb, the MOAB is the best bunker buster we’ve got. Update 1:49pm - White House press secretary Sean Spicer confirmed the MOAB attack in Afghanistan at a press conference. Spicer didn’t provide any more detail about the attack but instead referred reporters to Gen. John Nicholson, commander of US forces in Afghanistan, as well as the Defense Department for more information. It remains unclear if President Trump authorized or even knew about the bombing. Update 3:30pm - The Pentagon has issued a press release about the bombing in Afghanistan that identifies the ISIS faction targeted as the Khorason Group.